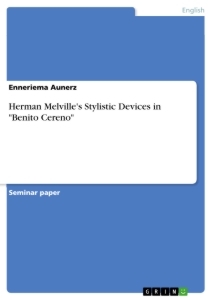 Herman Melville's Stylistic Devices in "Benito Cereno"
Herman Melville´s novel Benito Cereno was published 1856 in The Piazza Tales. It based on a real-life incident described in Amasa Delano´s Narrative of Voyages and valley in the Northern and Western Hemispheres (1817). 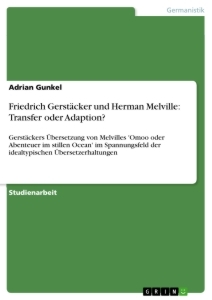 Relying on the source for the basic plot, Melville added a few additions to transform the factual report in a cryptic narrative relevant for readers of the 1850s. This term paper deals with the question of how the author deals with certain issues and why. Herman Melville´s novel appeared in 1856, five years before the Civil War broke out. Since then people had difficulties to understand the message of Benito Cereno because Melville spreads it in a very metaphoric way. He creates images to evoke moods and impressions but never tells the reader what is right or wrong. Everyone has to find out for himself what happened aboard the San Dominick. The following remarks will deliver some interpretative approaches. There is a wide margin of stilistic devices. They to characterize words, phrases, sentences or whole texts. A variety of techniques give an idea or feeling to the literal They are used to make writings more interesting and lively. Above all stilistic devices call the readers attention and express the authors intention (ct. ego4u.com). In the course of Benito Cereno one recognize quickly that Herman Melville created a medium that feels as if we join in the story. The reader accompanies Captain Delano aboard the Bachelor's Delight one morning in 1799. The area is devoid of humanity when a strange ship appeared in fogged distance. "The morning was one peculiar to that coast. Everything was mute and calm; everything gray. The sea, though undulated into long roods of swells, seemed fixed, and was sleeked at the surface like waved lead that has cooled and set in the smelter's mould. The sky seemed a gray surtout. Flights of troubled gray fowl, kith and kin with flights of troubled gray vapors among which they were mixed, skimmed low and fitfully over the waters, as swallows over meadows before storms. Shadows present, foreshadowing deeper shadows to come" (online-literature.com). "One of the powerful images conjured up by the words `gothic novel´ is that of a shadowy form rising from a mysterious place: Frankenstein´s monster rising from the laboratory table, Dracula creeping from his coffin, or, more generally, the slow opening of a crypt to reveal a dark and obscure figure" (Kilgour 1995: 3). The entrance to the plot frightens us because we read something into something. That is ambiguity. A common ship becomes a pirate ship and fog becomes danger thereby. If we were blank slates like the tabula rasa theory implies, the scene Melville describes would not be terrifying. But of course the author knows about the effect and tells us about possible connotations himself. "Considering the lawlessness and loneliness of the spot, and the sort of stories, at that day, associated with those seas, Captain Delano's surprise might have deepened into some uneasiness had he not been a person of a singularly undistrustful good-nature" (online-literature.com). Amasa Delano consideres other attitudes than implicit trust as weakness but not everyone shares this simplicity. Rather the setting encourage us to think further. Maggie Kilgour cites J.M.S. Tompkins, who says: "The fates of human beings merely illustrate the nature of these places, while they themselves make the story and brood over it". Thus characters in gothic novels subordinate to plot and moralising. Consequently the novel conveys meaning through the interpretation of the poetic visions. In Benito Cereno, Melville weaved a brilliant mesmerizing texture of decay that needs to be rearranged by the reader (ct. Kilgour 1995: 5). 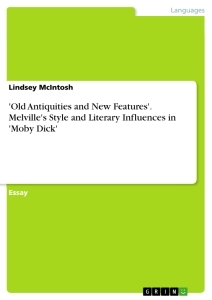 To maintain the creepy atmosphere, Melville provides the text with concrete images of the rundown ship. Actually we do not have to fear an approaching ship but its bad condition makes it a kind of monster: "Her keel seemed laid, her ribs put together, and she launched, from Ezekiel's Valley of Dry Bones" (online-literature.com). The San Dominick is a threat because she serves as venue for following events that lead to the enfeeblement of Delano's spirit finally. "Shut up in these oaken walls, chained to one dull round of command, whose unconditionality cloyed him, like some hypochondriac abbot he moved slowly about, at times suddenly pausing, starting, or staring, biting his lip, biting his finger-nail, flushing, paling, twitching his beard, with other symptoms of an absent or moody mind. This distempered spirit was lodged, as before hinted, in as distempered a frame. He was rather tall, but seemed never to have been robust, and now with nervous suffering was almost worn to a skeleton" (online-literature.com). The reader noticed that something terrible happened to Cereno. Even Delano realized that past left its mark on him. But he is not able to see the play in front of his eyes because he sticks to his self-image and prejudices against blacks. Even when he saw a black mistreating a white he is satisfied with the spurious comment of Don Benito. The statement: "`Faithful fellow!´ cried Captain Delano. `Don Benito, I envy you such a friend; slave I cannot call him´" (online-literature.com) illustrates that Delano is no brutal slave driver. W.C. Miller calls him a "benign racist" instead (ct. Miller 2007: 9). One one hand he esteems some of the blacks features on the other hand he depreciate Babo by calling him a "shepherd's dog". Delano compares the Africans to animals often. He does not consider blacks as men with emotions and reasons that he would concede to his equals. They are not more than servants. Once the idea Cereno might be in cahoots with the blacks comes to Delano´s mind but he reduces the thought to absurdity: "who ever heard of a white so far a renegade as to apostatize from his very species almost, by leaguing in against it with Negroes" (online-literature.com)? The discrepancy between Delano´s perceptions from the first sight of the ship to the end and the real balance of power is another suspense generating principle. Again and again the reader observes the disagreements between Delano's perception and the real circumstances on the San Dominick. The captain comes near to the truth often but his confidence outweighs always and he diverges again. The technique, in which the repetitions do not contribute anything to the main conflict, reminds Klaus Ensslen of E.A. Poe´s gothic novels. The method of mystification is not used for its own sake but a means to an end according to him. Delano's superficial optimism is reflected in his attitude towards black people, too. His thoughts denounce them repeatedly. In consideration of the attendant circumstances, the story takes on an ironic dimension. At one point even his body seems to be more sensitive than his mind: "Gingerly enoughstepped good Captain Delano between them, and in the instant of leaving them behind, like one running the gauntlet, he felt an apprehensive twitch in the calves of his legs" (online- literature.com). Nature functions as metaphor not only at the beginning. It reflects Delano's worldview which bans all inconveniences. Especially the peaceful evening atmosphere affects him or rather he admits to affect him: "he saw the benign aspect of nature, taking her innocent response in the evening; the screened sun in the quiet camp of the west shining out like the mild light from Abraham´s tent [...]" (online-literature.com). Here romantic mood comes up. This is another typical aspect of gothic novels, since the genre emerged from romanticism (ct. Kilgour 1995: 3). He leaned against the carved balustrade, again looking off toward his boat; but found his eye falling upon the ribbon grass, trailing along the ship's water-line, straight as a border of green box; and parterres of sea-weed, broad ovals and crescents, floating nigh and far, with what seemed long formal alleys between, crossing the terraces of swells, and sweeping round as if leading to the grottoes below. And overhanging all was the balustrade by his arm, which, partly stained with pitch and partly embossed with moss, seemed the charred ruin of some summer-house in a grand garden long running to waste. Trying to break one charm, he was but becharmed anew. Though upon the wide sea, he seemed in some far inland country; prisoner in some deserted château, left to stare at empty grounds, and peer out at vague roads, where never wagon or wayfarer passed (online-literature.com). The author manages to make Delano´s feelings and concerns noticeable. The figure of speech is so strong that it exceeds its function in the narrative and is the epitome of lost individuals in a mysterious world. The reader is again involved directly by an increase in details of speech and picture quality (ct. Ensslen 1966: 76). It requires fortitude to over come problems. One can only get on to the secret of the story if one does not share Captain Delano´s limited point of view. Suitably the setting of Benito Cereno takes place in the era of revolution. After the Declaration of Independence (1776) and the French Revolution (1789) people should be encouraged to use their own understanding, according to Immanuel Kant. Melville demands the same by giving Delano and the reader signals that need to be deciphered. The Gordian knot is one mystery for example. "The old man looked like an Egyptian priest, making Gordian knots for the temple of Ammon. The knot seemed a combination of double-bowline-knot, treble-crown-knot, back-handed-well-knot, knot-in-and- out-knot, and jamming-knot.